The original heuristic argument that such a limit should exist was given by Heisenberg, after whom it is sometimes named the Heisenberg principle. This ascribes the uncertainty in the measurable quantities to the jolt-like disturbance triggered by the act of observation. Though widely repeated in textbooks, this physical argument is now known to be fundamentally misleading. While the act of measurement does lead to uncertainty, the loss of precision is less than that predicted by Heisenberg’s argument; the formal mathematical result remains valid, however. Historically, the uncertainty principle has been confused with a somewhat similar effect in physics, called the observer effect, which notes that measurements of certain systems cannot be made without affecting the systems. Heisenberg offered such an observer effect at the quantum level (see below) as a physical “explanation” of quantum uncertainty. It has since become clear, however, that the uncertainty principle is inherent in the properties of all wave-like systems, and that it arises in quantum mechanics simply due to the matter wave nature of all quantum objects. Thus, the uncertainty principle actually states a fundamental property of quantum systems, and is not a statement about the observational success of current technology. It must be emphasized that measurement does not mean only a process in which a physicist-observer takes part, but rather any interaction between classical and quantum objects regardless of any observer. Since the uncertainty principle is such a basic result in quantum mechanics, typical experiments in quantum mechanics routinely observe aspects of it. Certain experiments, however, may deliberately test a particular form of the uncertainty principle as part of their main research program. These include, for example, tests of number-phase uncertainty relations in superconducting or quantum optics systems. Applications dependent on the uncertainty principle for their operation include extremely low noise technology such as that required in gravitational-wave interferometers. As a principle, Heisenberg’s uncertainty relationship must be something that is in accord with all experience. However, humans do not form an intuitive understanding of this indeterminacy in everyday life, so it may be helpful to demonstrate how it is integral to more easily understood physical situations. Two alternative conceptualizations of quantum physics can be examined with the goal of demonstrating the key role the uncertainty principle plays. A wave mechanics picture of the uncertainty principle provides for a more visually intuitive demonstration, and the somewhat more abstract matrix mechanics picture provides for a demonstration of the uncertainty principle that is more easily generalized to cover a multitude of physical contexts. Mathematically, in wave mechanics, the uncertainty relation between position and momentum arises because the expressions of the wavefunction in the two correspondingorthonormal bases in Hilbert space are Fourier transforms of one another (i.e., position and momentum are conjugate variables). A nonzero function and its Fourier transform cannot both be sharply localized. 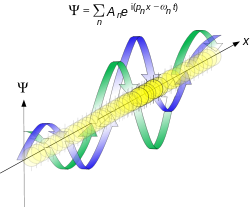 A similar tradeoff between the variances of Fourier conjugates arises in all systems underlain by Fourier analysis, for example in sound waves: A pure tone is a sharp spike at a single frequency, while its Fourier transform gives the shape of the sound wave in the time domain, which is a completely delocalized sine wave. In quantum mechanics, the two key points are that the position of the particle takes the form of a matter wave, and momentum is its Fourier conjugate, assured by the de Broglie relation p = ħk, where k is the wavenumber. In matrix mechanics the mathematical formulation of quantum mechanics, any pair of non-commuting self-adjoint operators representing observables are subject to similar uncertainty limits. An eigenstate of an observable represents the state of the wavefunction for a certain measurement value (the eigenvalue). For example, if a measurement of an observable A is performed, then the system is in a particular eigenstate Ψ of that observable. However, the particular eigenstate of the observable A need not be an eigenstate of another observableB: If so, then it does not have a unique associated measurement for it, as the system is not in an eigenstate of that observable. As with the wave mechanics interpretation above, we see a tradeoff between the precisions of the two, given by the uncertainty principle. where i, j, k are distinct and Ji denotes angular momentum along the xi axis. 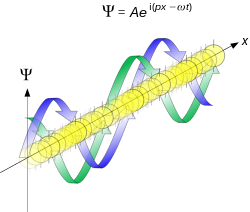 This relation implies that unless all three components vanish together, only a single component of a system’s angular momentum can be defined with arbitrary precision, normally the component parallel to an external (magnetic or electric) field. Moreover, for , a choice , in angular momentum multiplets, ψ = |j, m 〉, bounds the Casimir invariant (angular momentum squared, ) from below and thus yields useful constraints such as j (j + 1) ≥ m(m + 1), and hence j ≥ m, among others. where σE is the standard deviation of the energy operator (Hamiltonian) in the state ψ, σB stands for the standard deviation of B. Although the second factor in the left-hand side has dimension of time, it is different from the time parameter that enters the Schrödinger equation. It is a lifetime of the stateψ with respect to the observable B: In other words, this is the time interval (Δt) after which the expectation value changes appreciably. An informal, heuristic meaning of the principle is the following: A state that only exists for a short time cannot have a definite energy. To have a definite energy, the frequency of the state must be defined accurately, and this requires the state to hang around for many cycles, the reciprocal of the required accuracy. For example, in spectroscopy, excited states have a finite lifetime. By the time-energy uncertainty principle, they do not have a definite energy, and, each time they decay, the energy they release is slightly different. The average energy of the outgoing photon has a peak at the theoretical energy of the state, but the distribution has a finite width called the natural linewidth. Fast-decaying states have a broad linewidth, while slow decaying states have a narrow linewidth. The same linewidth effect also makes it difficult to specify the rest mass of unstable, fast-decaying particles in particle physics. The faster the particle decays (the shorter its lifetime), the less certain is its mass (the larger the particle’s width). with position and momentum each contributing an amount in a “balanced” way. Moreover every squeezed coherent state also saturates the Kennard bound although the individual contributions of position and momentum need not be balanced in general. Position space probability density of an initially Gaussian state moving at minimally uncertain, constant momentum in free space. Such a formulation is both mathematically incorrect and experimentally refuted. It is also possible to derive a similar uncertainty relation combining both the statistical and systematic error components. for some arbitrary fixed length scale . A few remarks on these inequalities. First, the choice of base e is a matter of popular convention in physics. The logarithm can alternatively be in any base, provided that it be consistent on both sides of the inequality. Second, the numerical value on the right hand side assumes the unitary convention of the Fourier transform, used throughout physics and elsewhere in this article. Third, the normal distribution saturates the inequality, and it is the only distribution with this property, because it is the maximum entropy probability distribution among those with fixed variance (cf. here for proof). Further mathematical uncertainty inequalities, including the above entropic uncertainty, hold between a function f and its Fourier transform ƒ̂. In the context of signal processing, and in particular time–frequency analysis, uncertainty principles are referred to as the Gabor limit, after Dennis Gabor, or sometimes the Heisenberg–Gabor limit. The basic result, which follows from “Benedicks’s theorem”, below, is that a function cannot be both time limitedand band limited (a function and its Fourier transform cannot both have bounded domain)—see bandlimited versus timelimited. Stated alternatively, “One cannot simultaneously sharply localize a signal (function f ) in both the time domain and frequency domain ( ƒ̂, its Fourier transform)”. Amrein-Berthier and Benedicks’s theorem intuitively says that the set of points where f is non-zero and the set of points where ƒ̂ is nonzero cannot both be small. One expects that the factor may be replaced by , which is only known if either S or Σ is convex. where P is a polynomial of degree (N−d)/2 and A is a real d×d positive definite matrix. This result was stated in Beurling’s complete works without proof and proved in Hörmander (the case ) and Bonami, Demange, and Jaming for the general case. Note that Hörmander–Beurling’s version implies the case ab > 1 in Hardy’s Theorem while the version by Bonami–Demange–Jaming covers the full strength of Hardy’s Theorem. A different proof of Beurling’s theorem based on Liouville’s theorem appeared in Hedenmalm. In 1925, following pioneering work with Hendrik Kramers, Heisenberg developed matrix mechanics, which replaced the ad-hoc old quantum theory with modern quantum mechanics. The central premise was that the classical concept of motion does not fit at the quantum level, as electrons in an atom do not travel on sharply defined orbits. Rather, their motion is smeared out in a strange way: the Fourier transform of its time dependence only involves those frequencies that could be observed in the quantum jumps of their radiation. Heisenberg’s paper did not admit any unobservable quantities like the exact position of the electron in an orbit at any time; he only allowed the theorist to talk about the Fourier components of the motion. Since the Fourier components were not defined at the classical frequencies, they could not be used to construct an exact trajectory, so that the formalism could not answer certain overly precise questions about where the electron was or how fast it was going. 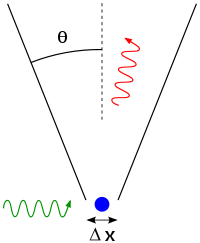 Heisenberg’s gamma-ray microscope for locating an electron (shown in blue). The incoming gamma ray (shown in green) is scattered by the electron up into the microscope’s aperture angle θ. The scattered gamma-ray is shown in red. Classical optics shows that the electron position can be resolved only up to an uncertainty Δx that depends on θ and the wavelength λof the incoming light. The principle is quite counter-intuitive, so the early students of quantum theory had to be reassured that naive measurements to violate it were bound always to be unworkable. One way in which Heisenberg originally illustrated the intrinsic impossibility of violating the uncertainty principle is by using an imaginary microscope as a measuring device. He imagines an experimenter trying to measure the position and momentum of an electron by shooting a photon at it. Problem 1 – If the photon has a short wavelength, and therefore, a large momentum, the position can be measured accurately. But the photon scatters in a random direction, transferring a large and uncertain amount of momentum to the electron. If the photon has a long wavelength and low momentum, the collision does not disturb the electron’s momentum very much, but the scattering will reveal its position only vaguely. Problem 2 – If a large aperture is used for the microscope, the electron’s location can be well resolved (seeRayleigh criterion); but by the principle of conservation of momentum, the transverse momentum of the incoming photon and hence, the new momentum of the electron resolves poorly. If a small aperture is used, the accuracy of both resolutions is the other way around. The combination of these trade-offs imply that no matter what photon wavelength and aperture size are used, the product of the uncertainty in measured position and measured momentum is greater than or equal to a lower limit, which is (up to a small numerical factor) equal to Planck’s constant. Heisenberg did not care to formulate the uncertainty principle as an exact limit (which is elaborated below), and preferred to use it instead, as a heuristic quantitative statement, correct up to small numerical factors, which makes the radically new noncommutativity of quantum mechanics inevitable. The Copenhagen interpretation of quantum mechanics and Heisenberg’s Uncertainty Principle were, in fact, seen as twin targets by detractors who believed in an underlying determinism and realism. According to the Copenhagen interpretation of quantum mechanics, there is no fundamental reality that the quantum state describes, just a prescription for calculating experimental results. There is no way to say what the state of a system fundamentally is, only what the result of observations might be. Albert Einstein believed that randomness is a reflection of our ignorance of some fundamental property of reality, while Niels Bohr believed that the probability distributions are fundamental and irreducible, and depend on which measurements we choose to perform. Einstein and Bohr debated the uncertainty principle for many years. Some experiments within the first decade of the twenty-first century have cast doubt on how extensively the uncertainty principle applies. 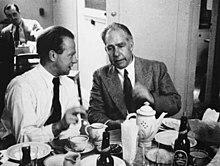 Bohr’s response was that the wall is quantum mechanical as well, and that to measure the recoil to accuracy Δp, the momentum of the wall must be known to this accuracy before the particle passes through. This introduces an uncertainty in the position of the wall and therefore the position of the slit equal to h/Δp, and if the wall’s momentum is known precisely enough to measure the recoil, the slit’s position is uncertain enough to disallow a position measurement. But Einstein came to much more far-reaching conclusions from the same thought experiment. He believed the “natural basic assumption” that a complete description of reality, would have to predict the results of experiments from “locally changing deterministic quantities”, and therefore, would have to include more information than the maximum possible allowed by the uncertainty principle. In 1964, John Bell showed that this assumption can be falsified, since it would imply a certain inequality between the probabilities of different experiments. Experimental results confirm the predictions of quantum mechanics, ruling out Einstein’s basic assumption that led him to the suggestion of his hidden variables. Ironically this fact is one of the best pieces of evidence supporting Karl Popper’s philosophy of invalidation of a theory by falsification-experiments. That is to say, here Einstein’s “basic assumption” became falsified by experiments based on Bell’s inequalities. For the objections of Karl Popper against the Heisenberg inequality itself, see below. While it is possible to assume that quantum mechanical predictions are due to nonlocal, hidden variables, and in fact David Bohm invented such a formulation, this resolution is not satisfactory to the vast majority of physicists. The question of whether a random outcome is predetermined by a nonlocal theory can be philosophical, and it can be potentially intractable. If the hidden variables are not constrained, they could just be a list of random digits that are used to produce the measurement outcomes. To make it sensible, the assumption of nonlocal hidden variables is sometimes augmented by a second assumption—that the size of the observable universe puts a limit on the computations that these variables can do. A nonlocal theory of this sort predicts that a quantum computer would encounter fundamental obstacles when attempting to factor numbers of approximately 10,000 digits or more; a potentiallyachievable task in quantum mechanics. Karl Popper approached the problem of indeterminacy as a logician and metaphysical realist. He disagreed with the application of the uncertainty relations to individual particles rather than to ensembles of identically prepared particles, referring to them as “statistical scatter relations”. In this statistical interpretation, a particular measurement may be made to arbitrary precision without invalidating the quantum theory. This directly contrasts with the Copenhagen interpretation of quantum mechanics, which is non-deterministic but lacks local hidden variables. Popper proposed an experiment to falsify the uncertainty relations, although he later withdrew his initial version after discussions with Weizsäcker,Heisenberg, and Einstein; this experiment may have influenced the formulation of the EPR experiment. The many-worlds interpretation originally outlined by Hugh Everett III in 1957 is partly meant to reconcile the differences between the Einstein and Bohr’s views by replacing Bohr’s wave function collapse with an ensemble of deterministic and independent universes whose distribution is governed by wave functions and the Schrödinger equation. Thus, uncertainty in the many-worlds interpretation follows from each observer within any universe having no knowledge of what goes on in the other universes. Some scientists including Arthur Compton and Martin Heisenberg have suggested that the uncertainty principle, or at least the general probabilistic nature of quantum mechanics, could be evidence for the two-stage model of free will. The standard view, however, is that apart from the basic role of quantum mechanics as a foundation for chemistry, nontrivial biological mechanisms requiring quantum mechanics are unlikely, due to the rapiddecoherence time of quantum systems at room temperature.